bostonbubble.com :: View topic - What happened to "months of supply" stats? What happened to "months of supply" stats? Posted: Fri Jul 28, 2017 2:55 pm GMT Post subject: What happened to "months of supply" stats? The real estate professionals used to publish data on how many months of supply were available in a given region. This is calculated by dividing the number of active listings by the number of sold properties over the previous 12 months (according to this L.A. Realtor's blog). Nobody seems to be using this stat in Boston in 2017. What's going on? Is the supply so low that the number is discouraging or misleading? Supply seems to be measured simply as number of active listings today. This is useful but does not reflect the overall volume of transactions. 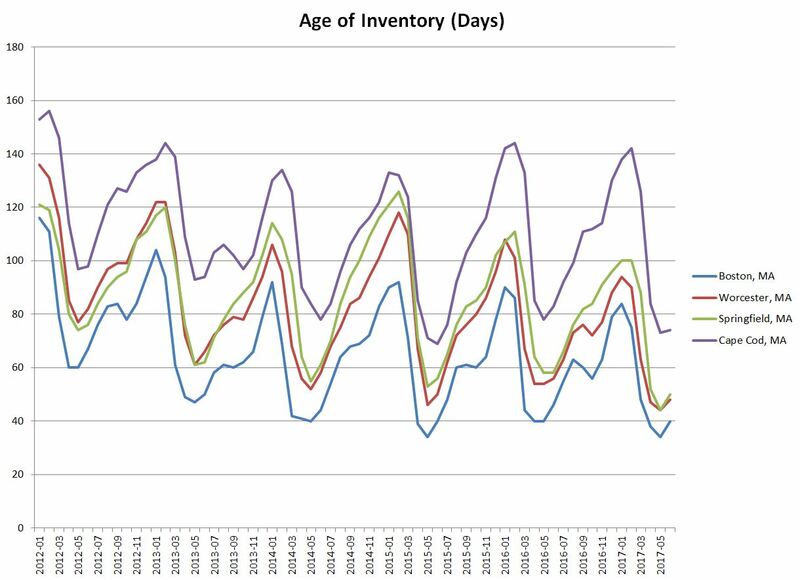 Zillow has a related metric, "Age of Inventory (Days)" and tracks monthly time series for different metro areas. I think this is a more direct way to measure what "Months of Supply" was supposed to measure. So, thanks for the tip. It certainly tells a story. I was hoping to find a finer-grained metric, by town and property type, like 3BR condos in Watertown.